Proper shaft alignment is essential to the operating efficiency of rotating machinery. Correctly aligned shafts ensure smooth, even power transmission from the motor to the driven components. 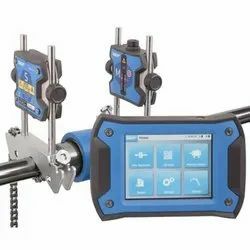 Though there is a variety of shaft alignment tools and methods to choose from, including straightedge or feeler gauges, dial indicators, and optics – today’s laser shaft alignment systems offer significant advantages over these traditional methods. Portable, quick, and accurate, laser shaft alignment systems have become the tool of choice for many industrial applications. There are a variety of laser alignment systems available from several vendors, yet the basic components and alignment methodology are the same. Laser shaft alignment systems typically consist of two sensors (laser emitters/receivers), rods, brackets, chains, and a display unit. Most systems today have Bluetooth Wireless built-in or some even have the ability to connect directly through a downloadable app on a tablet or smartphone. Laser shaft alignment systems can be modified with extended chains for larger diameter shafts, and longer rods for aligning shafts with larger couplings or to avoid obstructed laser paths. Before the sensors are mounted, a pre-alignment check should be completed. Pre-alignment includes performing a rough alignment, eliminating obvious soft foot, tightening bolts and doing a final soft check. Once the pre-alignment check is complete, the sensors are mounted to both the stationary and movable shafts or coupling hubs, and the lasers beams are turned on. The operator will then be prompted to run through a predetermined series of steps which include entering specified dimensions and selecting the necessary tolerances based on either the preset choices or customizing to the customer’s tolerance specifications.